June 28, 1914 — A dustup in Sarajevo: Someone shot dead Archduke Franz Ferdinand and his wife Sophie, Duchess of Hohenberg. That tragedy triggered a Great World War. While the Industrial Revolution had been changing the way we do things, first in Britain and then in America, trains speeding up travel, factory chimneys polluting the air, the changes were gradual. The First World War produced a shock wave, crumbling the cultural towers of society, changing our ways suddenly, unexpectedly and forever. June 28, 1919 — The signing of the Treaty of Versailles: The Germans were peeved. For some 20 years they held a grudge. With so many of our faces buried in our smart devices these days, it might be expected someone will soon start marketing screen savers for our noses. Do we think about the causes and effects of these events leading from one Great War to the next and to the insidious spread of Communism and the Cold War, and on and on and on and on? You know how it goes. Or we should; alas, most of us, no. The interweaving of events of the 20th century and into the 21st has produced one long fugue. The New York Times has published a beautiful and thought-provoking photo essay and story today: “The War to End All Wars? Hardly. But It Did Change Them Forever”: http://goo.gl/qJfTp8. World War II Observation Towers on the Delaware Bay. From these we watched for German submarines coming up the United States East Coast, from the Atlantic Ocean, up the bay to the chemical plants and refineries lining the Delaware River from Wilmington, Del., to Philadelphia, Pa. Photo by Robert Price. Excellent, Robert. Beautifully written. Encompasses the twin towers of poignancy and pertinence. 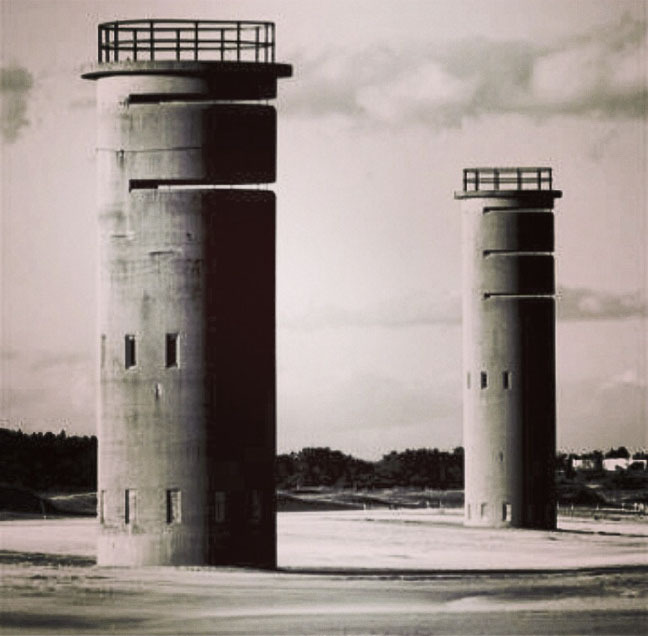 How thoughtful and significant the accompanying photo of the World War II watch towers, standing sentinel along the Delaware Bay beaches, persistent reminders for the young people who know what those towers are. Thought provoking vis-à-vis the 28 June 1919 signing of the Treaty of Versailles, the 100th anniversary of the First World War; and of the 70th anniversary of the Second World War Western Allies landing on Omaha Beach, D-Day and the Battle of Normandy. Poppies grow in the French fields now, shrouding where the unknown soldiers missing in action rest. When will they ever learn? When will they ever learn…?